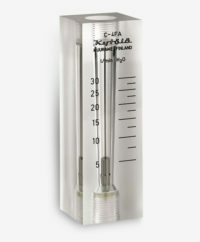 The Kytola variable area flow meter Model C is made from a high-quality, machined acrylic and features a clear scale for efficient and accurate reading. The Model C variable area flow meter is suitable for temperatures up to 75°C and for pressures up to 20 bar (30 bar/30°C). Model C flow meters are typically used in gas and liquid applications, such as water treatment and sealing water measurements. Similar products in this range include the Model D. Please call us if you would like any more information about these flow meters.